Gunter's Buckwheat honey is the darkest of all with very deep copper looking color. It tastes rich and malty, similar to molasses. Use to soothe your throat, in cooking or drinks in place of sugars or molasses. Try it in Chai tea or coffee for a real treat. 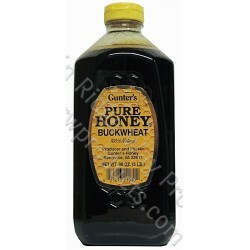 Buckwheat honey is said to have the most antioxidants of any honey variety. Buckwheat honey is honey that is made from the pollen and nectar of buckwheat - which is not actually wheat and contains no gluten!